Otherwise. 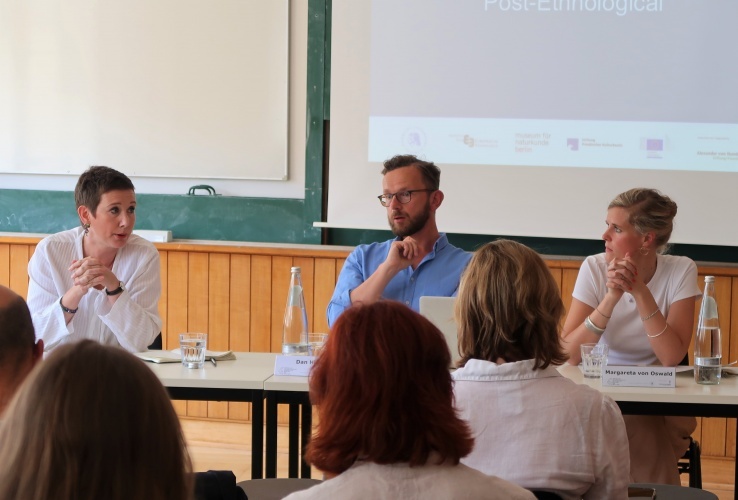 Rethinking Museums and Heritage was the title of a three-day symposium, which brought together a group of international scholars and museum professionals at Humboldt-Universität zu Berlin to think differently about the objects and materialities of museums and heritage. 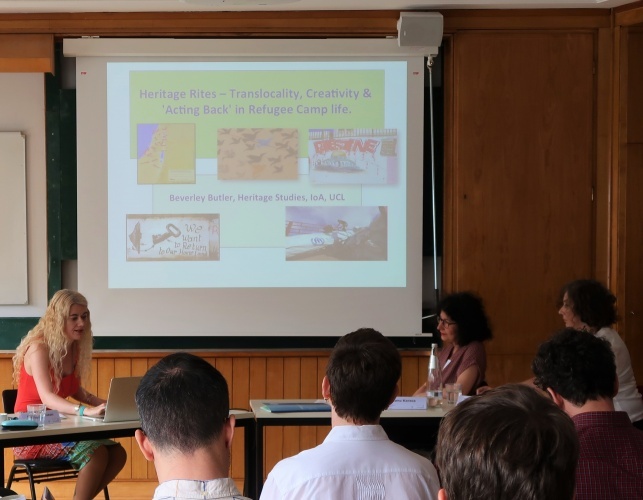 Organized by the Centre for Anthropological Research on Museums and Heritage (CARMAH), the event was structured around five concepts, which have recently gained currency in the fields of museum and heritage studies. 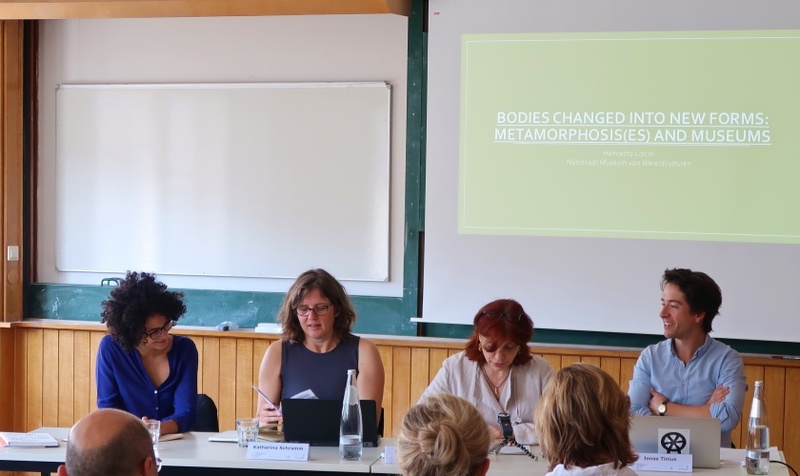 CARMAH researchers chaired a series of five panels, taking on one concept each, to be discussed by three invited speakers before conversations opened up to all participants. As CARMAH director Sharon Macdonald pointed out in introducing the event, concepts that have historically been taken up or developed inside museums include “progress,” “evolution,” or “the primitive.” Each of these, Macdonald reminded us, brought with them particular epistemologies, affordances, effects and modes of representation—Pitt Rivers’ famous typological displays or the live group arrangements of Franz Boas come to mind, for instance—while at the same time shaping ideas about the public and the nature of citizenship. The keynote was delivered by Haidy Geismar, Reader in Anthropology at University College London (UCL) and curator of UCL’s anthropology collections. Her lecture, Objects Otherwise, took place at the Tieranatomisches Theater of Humboldt-Universität zu Berlin. Erected in 1790, the early Prussian Classicist building with its impressive dome is the city’s oldest surviving seminar building—a space purpose-built for performative and exhibitionary practice, and, as in the case of necropsy, the transformation of sentient being into object of science and scholarship. Geismar’s talk took the form of an “object lesson”—a learning from, rather than about, the material world. Object lessons, Geismar emphasized, are both epistemological and ontological in their engagement with the historicity of objects as well as the narration of that historicity in the form of exhibitions or writing. Fittingly, therefore, the lecture invited critical engagement with the history of scientific thought and practice that gave rise to structures such as the Tieranatomisches Theater. A wooden box for lantern slides, an unprovenanced mid-20th-century Maori cloak in the collection of UCL, a Rambaramp sculpture from Vanuatu at New York City’s Metropolitan Museum of Art, and a virtual collecting pen developed by the Cooper Hewitt Design Museum—Geismar focused on four objects and their remediation via digital technologies. All of her examples showed interactions between old objects and new technology to be more complex than entrenched distinctions between the digital and the material imply. Rather than two fundamentally separate entities, or reductions of one (the material) to an ahistorical infrastructure of the other (the digital), Geismar suggested to think of their relationship in the form of an interface. This interface, she argued, itself encodes knowledge, meaning, difference, and as such offers a productive space to think about the complexities of practices and concepts such as provenance. Consider the cloak: A collaboration between Geismar, Maori artists Kura Puke and interaction designer Stuart Foster (Massey University of New Zealand), and the Taranaki-based Te Matahiapo Research Organization. 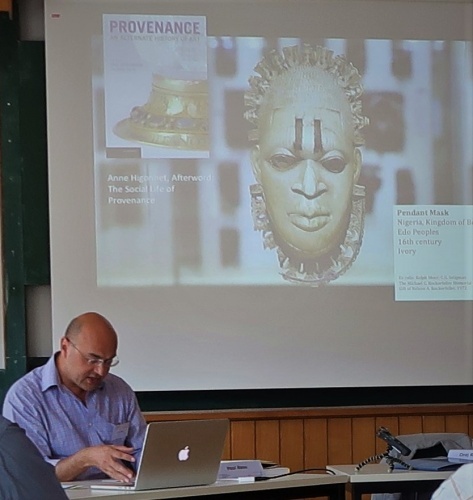 The project explored the potentials (and shortcomings) of digital communications and imaging technology to reestablish connections between the cloak and Maori representatives in New Zealand, and to forge ongoing relations between Maori and London-based researchers. What Geismar and her collaborators came to call Te Ara Wairua: Pathways of the Intangible drew on Maori understandings of wairua—the spiritual pathways brought into being by all taonga, treasured possessions that facilitate and maintain ancestral connectivity. Maori researcher Te Urutahi Waikerepuru renamed the cloak “ancestral tears,” recognizing the lack of connection signaled by the object’s missing provenance while at the same time (re-)integrating the cloak into a known genealogy. To accomplish this, researchers used facetime and Skype to turn the UCL museum gallery into a ceremonial space that would allow to re-enliven the object by means of chant and song. Geismar drew attention to the various interferences and disruptions which imperiled the creation of these techno-spiritual pathways, causing herself and fellow UCL researchers considerable anxiety. She noted, however, how she began to understand such disruptions as signs of physical as well as economic distance, manifest in different quality internet connections, for instance. Such technological failures, Geismar suggested, evoked situations of dislocation and disconnection that can never be fully salvaged, regardless of present or future technological interventions. The researchers encountered another problem when they tried to create a digital copy of the cloak using 3D imaging technology. The objective was to create an iteration of the object that would be able to travel back to New Zealand. Hair and fabric, however, two core constituents of the object, are notoriously hard to render as digital scans. Yet this hitch in the interface inspired creative workarounds: With the use of a gaming software, scanned data was converted into a digital environment that resembled an immersive, three-dimensional map. Interactions with the object thus evoked virtual travel, flying across the cloak-as-landscape. This conversion, Geismar pointed out, aligned with Maori notions of materiality, in which objects are understood to form a connective tissue linking person and place. Throughout, Geismar’s object-lessons showed how the digital offers no one-size-fits-all solutions with respect to the complex histories of social relationships embedded in museum collections. Two cases in point: The digital representation of a Rambaramp effigy collected from Vanuatu in the late 1960s as it now appears in the online catalogue of New York’s Metropolitan Museum of Art; and the virtual collections visitors are invited to create in the newly renovated galleries of the Cooper Hewitt Design Museum, also located in New York City. In the case of the effigy, contested narratives of provenance were flattened out by the representational conventions of the Met’s online catalogue and remained as invisible as the sculpture itself after it had been removed from the museum’s Oceania galleries. The Cooper Hewitt Pen, Geismar’s last example, is an interactive technology that enables visitors to create their own virtual collections by connecting up the device to the interface of the interactive exhibition tables used for the display of artifacts. Contra the museum’s emphasis on new forms of engagement and learning experience, Geismar suggested that the technology in fact perpetuates “ways of seeing” that have their origins in the motivations of late nineteenth and early twentieth century collectors. She showed how the reference point of visitor-collections are not the objects themselves or forms of research that have the potential to trouble established narratives of design history. Instead, it is the standardized data provided by the museum’s collection management system that visitors are invited to learn from. Digital media, Geismar concluded, possess no essential qualities in and of themselves, but emerge from existing ways of engagement. Only through close attention to the interface between “old” and “new,” and the critical reflexivity such attention enables, can we move toward engagements that think and do otherwise. In the ensuing Q&A, Ciraj Rassool, Professor of History at University of Western Cape, brought up the question of repatriation, which, he remarked, formed a ubiquitous political background of sorts, to many of the projects presented by Geismar. Asking about the notions of materiality and objecthood engendered by digital technologies, he suggested, also requires asking about the kinds of personhood created by the digital. Questions about repatriation and the history of the person were taken up in depths by Rassool in his contribution to the panel on “Provenance,” which launched day two of the symposium. This question, raised by chair Larissa Förster, set the tone for the contributions to follow. In the German context, Förster explained, the term “provenance” has been transferred to the context of ethnographic collections from the field of art history. Treating provenance as a concept, then, means asking about the effects of this genealogy, especially when contrasted to alternative approaches in anthropology, which have long paid critical attention to the “social life” of objects (Appadurai). “Is there an epistemology of provenance,” asked Förster, “a history, a theory?” and introduced some possible ways of approaching these questions. For example, some understandings of provenance, she noted, tend to be marked by an overemphasis on roots and followed a narrowly defined bi-directional model of taking and returning, within which “source” and “destination” are frequently mistaken for stable entities. The result is a foreclosure of alternative paths that is paralleled, in a sense, by a limited focus on questions of legitimate or illegitimate ownership. A provenance discourse reduced to these terms and models, Förster suggested, is unable to account for more complex scenarios, which remain outside its purview: The gift or acts of giving as generative of social relationships, for instance, or forms of reconnection that do not neatly fit the legal category of “possession.” Does the concept of provenance carry the potential to probe more complex questions about the plurality of temporal regimes and the multiple trajectories that museum objects have come embody via their historical and contemporary circulation? How, she asked, would our understanding of provenance have to be transformed in order for the concept to do such work? Speakers Ciraj Rassool and Paul Basu, Professor of Anthropology at SOAS University of London, each focused on different possibilities for such extension or transformation. Drawing on their research in South Africa and Sierra Leone as well as British and Austrian museums, they introduced the concepts of “the forensic” and “diaspora,” productively putting them into conversation with that of provenance to tease out and critically examine some of the assumptions underpinning the term. Rassool’s discussion of the forensic drew connections between the colonial dead in national and international museum collections and the work of South Africa’s Missing Persons Task Team, charged with uncovering the stories behind apartheid era murder and abductions. His talk traced these connections through the disciplinary history of physical anthropology—from its complicity with colonial crimes to its current reinvention in the guise of forensic science. Rassool argued for a more open-ended notion of the forensic, which encompasses the legal and evidentiary—at stake in the precise identification of the dead and the forensic reconstruction of a person’s history. With its etymological origins in the Latin term forensis—“pertaining to the forum”—the forensic may also open up a space of citizenship and debate, according to Rassool. As such, it could form the basis for an engaged museology, he suggested, that moves beyond narrow understandings of provenance, which reduce the complex and complexly entwined biographies of objects and persons to the conventions of collections management. His talk concluded with a number of questions: How do we think about or pose the question of origins? What is the discipline of provenance, and who can tell the history of the person with what disciplinary techniques? And—tying these problems back to the current prominence of forensic research—how do we critically engage with the evidentiary function of the forensic and the empiricist legacies of this concept? Contrasts between anthropological approaches to the biographical trajectories of objects and the reduction of these trajectories to questions of authenticity and legitimacy also formed the starting point of Paul Basu’s talk. Basu proposed the concept of diaspora as a means of thinking about questions of circulation and mutability, which have long been at the heart of anthropological concerns with material culture. From the exploits of colonial dispossession to a resource for recovering signs of local agency—Basu drew parallels between the tensions running through research concerned with the histories of ethnographic collecting on one side, and engagements with diasporic experiences and identities on the other. The latter, he stated, ranged from experiences of exclusion, loss, and rupture, to practices and conceptualizations of hybridity, creolization, and cosmopolitanism. Importantly, the concept of diaspora described a process of “putting up roots elsewhere” and thus a becoming rather than being in exile, he argued. “Is there a diasporic double consciousness in museum collections?” Making reference to the volume of diasporic remittances, by far outweighing international aide and development budgets, Basu asked what forms of reciprocity the presence of diasporic objects might enable. As in the logic of the gift, famously identified by Marcel Mauss, is there a value to avoiding closure? Provided that museums recognize and assume responsibility to activate the heritage in their care, the continued presence of ethnographic collections may hold the potential to open up relationships in ways not possible if those objects were returned and thus lost their diasporic status. Examples of such exchanges, Basu suggested, may include the exchange of technological or other forms of expertise. Building on these insights, he concluded by proposing the idea of the “stolen gift” as a productive contradiction to think about reciprocity in contexts deeply marked by the legacies of the colonial project. 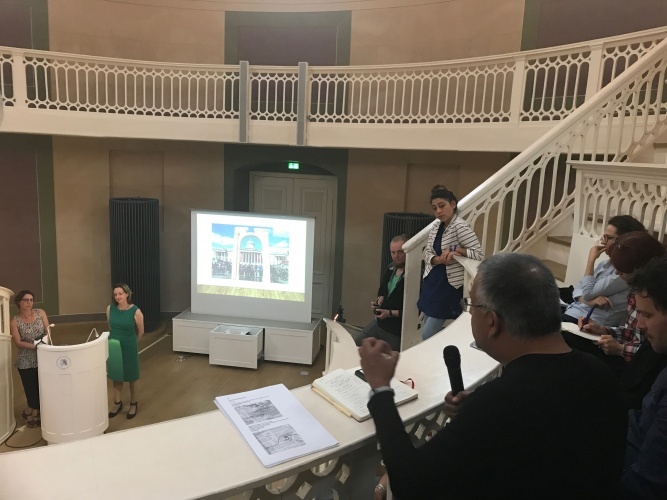 Discussant Britta Lange, a lecturer at the Institute of Cultural History and Theory at Humboldt-Universität zu Berlin and co-director of the institution’s Lautarchiv, tied Rassool’s and Basu’s contributions back to work currently taking place in Berlin. Tensions between the objectification of persons and the anthropomorphizing of things, as they are negotiated in discourses on human remains, she said, also run deeply through her own work with casts and media recordings that will be displayed in the Humboldt-Universität’s exhibitions at the Humboldt Forum. Collections of sound recordings or photographs, Lange noted, are frequently treated as unproblematic in terms of provenance, since they rely not on the physical removal of objects but the mimetic and reproductive properties of modern media technology. Challenging such assumptions, her work involves collaborations with researchers from the local contexts in which the collections were made to jointly explore the problematic conditions of their production. Lange drew parallels between investigations that emphasize the materiality of archival collections, and a focus on the relationship between objects and their mediated reproductions in the form of photographs or digital collection records. How we conceptualize this relationship, she suggested, has important consequences for how we understand and mobilize the potential of collection objects for contemporary reappropriation. Lange concluded by reflecting on the metaphor of the “empty museum.” Beyond its evocation of anxieties about the consequences of repatriation, she stated, this figure might allow for more space to think about narrative, and its role in imagining alternative futures for late 19th and early 20th century collections. In her introduction to the panel on translocality, Katarzyna Puzon elaborated how this concept may enrich debates in the fields of museum and heritage that are concerned with the movement of objects, persons, practices, and discourses. She emphasized the concept’s potential to critically engage with and to move beyond the political, geographical, and ideological parameters of the nation-state. As such, she suggested, translocality enables close attention to questions of scale and the practices and discourses through which different ideas about ‘the local’ or ‘the global’ are produced. Puzon opened the panel with some of these questions: What do webs or layers of connectedness and multiple forms of embeddedness look like from a non-Eurocentric perspective? How do we locate power in those interconnected configurations? And how does the idea of the virtual or the digital contribute to current negotiations of translocality? The first speaker was Beverly Butler, Reader in Cultural Heritage at University College London. Butler’s talk drew on her fieldwork in Palestinian refugee camps in Jordan. It was motivated by questions about the relationship of heritage to different ways of inhabiting and making sense of the status of Palestinian refugeeness, and the being or aspiring to an otherwise associated with the idea of “wellbeing.” Butler outlined some of the conflicts and impasses confronting her interlocutors, many of whom belong to a fourth generation of Palestinians born in refugee camps. Drawing on the work of Hannah Arendt, she made the point that being refugee meant being confronted with a dual pressure: a strong sense of dependency, on the decisions of refugee committees, for instance, enters into tension with the idea of representing the vanguard of one’s people. Butler explained how the idea of trauma, the war of 1948 as Catastrophe (An-Nakba), underlies all practices and negotiations of heritage, which themselves effect the passing down of traumatic narratives across generations. The remainder of Butler’s presentation took the form of an inventory of (trans-)local heritage production. Artifacts such as shoes containing small amounts of Palestinian soil, according to Butler, epitomize the work that such hybrid, created things perform. Heritage production, she suggested, allows her interlocutors to engage in the difference between homeland and their political situation as refugees, and provides means of managing identities shaped by a profound sense of displacement. She further pointed out how heritage was dominantly associated with food and clothing, and thus practices involving the sensoria and embodiment. Building on this, and with reference to the work of Giorgio Agamben, Butler proposed to think of heritage as a set of practices and discourses oriented toward “dressing bare life”—acts of communion that aspire to wellbeing in a situation commonly associated with the unmaking of personhood. Next up was Banu Karaca, who currently holds affiliations with Berlin’s Institute of Cultural Inquiry and the EUME research program (“Europe in the Middle East/The Middle East in Europe”) at the Forum Transregionale Studien. Karaca discussed the concept of translocality as it finds expression in her research on dispossessed, looted, and stolen artworks in the context of state violence in the late Ottoman Empire and early Turkish Republic. “How is the classification of artworks—their belonging to, or exclusion from the category of ‘Islamic art’—grounded in the changing political practices and conceptualizations of the state?” Karaca examined this question in the context of the Armenian genocide and other forms of state violence against non-Muslim populations, such as the expulsion of Greek Orthodox Christians and the imposition of a capital tax on non-Muslim citizens. Karaca described her work as concerned not only with the circulation of lost or stolen artworks as it is inflected by state violence, but also with how histories of dispossession are negotiated in the field of art history. Her research in the archives of dealers and collectors of Islamic art revealed, for instance, how the misidentification of artworks effects art-historical forgetting that is deeply entangled with a denial of state violence. Karaca’s talk showed how the translocal, material circulation of objects can be overwritten by dominant art historical discourses and the associated production of localities, traceable through the changing geographical contours of the category of “Islamic Art,” for instance. Translocal understandings of heritage, or the loss thereof, Karaca suggested, should be understood as shaped by both, the circulation of dispossessed works of art, and the silences produced through the writing of art history. Discussant Paola Ivanov, curator of the Ethnological Museum’s Africa collections, reflected on translocal perspectives as they have been developed in her own field of Indian Ocean Studies. She noted how translocality is particularly apt to describe the ways of life of Indian Ocean littoral societies, whose social organization does not easily map onto Western ideas of the nation-state. Rather than merely describing forms of mobility and movement between pre-existing localities, Ivanov stressed how translocal perspectives enable questions as to how locality itself is created through interconnectedness. Drawing on her research in Zanzibar, she noted how movement and localization do not constitute diametrically opposed processes. Instead, she came to understand society as created through the constant mixing of ideas, people, and things. In this sense, she explained, translocality can function as an important corrective to dominant narratives and a means to provincialize binary conceptualizations of identity, so dominant since the emergence of the nation-state, and to contrast them with plural logics of belonging. Bringing this discussion back to the museum, she contrasted translocal perspectives to the “countainer-model” of culture as it prevails in the geographical ordering of artifacts. The persistence of such classificatory systems, she suggested, poses challenges to exhibitions that seek to represent the translocal mobility of objects. Launching day three of the symposium, the panel on “alterity” was chaired by Jonas Tinius, who introduced the concept as “a founding preoccupation of anthropology”—from early constructions of “the primitive,” to de-colonial critiques of othering, to its current centrality and renegotiation in the context of the ontology debates. Following anthropologist Matei Candea, Tinius asked what it might mean, methodologically, to “take seriously” one’s interlocutors. The panel, then, was as much an interrogation of alterity as it explored ways of co-producing knowledge “otherwise,” in exchange with interlocutors whose epistemological and representational repertoires fall outside the field of anthropology, and include those of contemporary art (curating) and critical museology. The first speaker, Henrietta Lidchi, drew on her long-term experience working in museums, as Keeper of the Department of World Cultures at National Museums Scotland and, most recently, as chief curator of the Nationaal Museum van Weredculturen in Leiden. 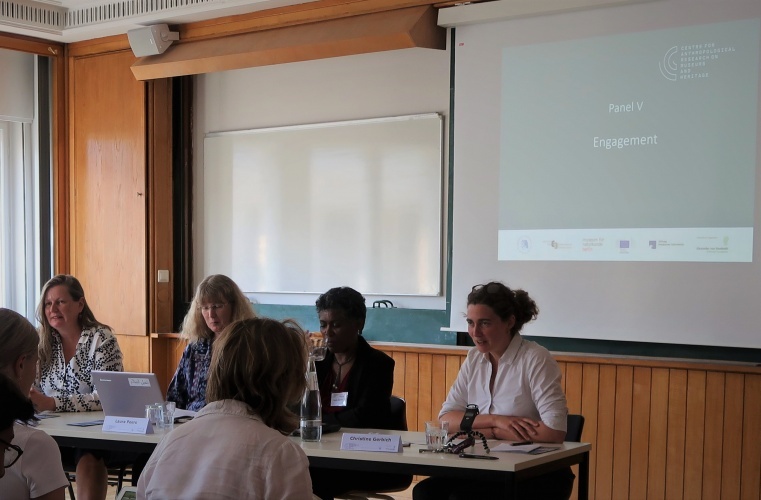 Katharina Schramm, Professor of Anthropology at Freie Universität Berlin, reported her experiences of co-organizing an exhibition that responded to the 2015-16 student protests at Stellenbosch University. In both Lidchi’s and Schramm’s accounts, the politics of refusal and the rejection of recognition emerged as sites for contemporary instantiations or means of retaining alterity. For Lidchi, alterity as refusal became manifest in the actions of Native American researchers and curators, who rejected an invitation by the London Royal Academy of Arts. In 2014, the institution had been meaning to consult about a planned exhibition of Native American art, and the predicament of how to “encompass the excess of history,” according to Lidchi. She cited Tlingit scholar Candice Hopkins, chief curator at IAIA Museum of Contemporary Native Arts and a member of the curatorial team of documenta 14, who had commented that the most radical response lay not in an engagement with the invitation, but in the more material stance of refusal. Lidchi further gave an account of the recent dismantling and subsequent ceremonial burning of artist Sam Durant’s work Scaffold, a sculpture that was partly based on the design of the gallows used in the execution of 38 Dakota men in Dakota War of 1862. Durant and the Walker Art Center responded to vehement protests by Dakota activists against the work’s inclusion as a cornerstone of the newly renovated Minneapolis Sculpture Garden. A significant break with museological values of preservation, public edification, and the realization of artistic freedom, the decision to destroy Scaffold resonated with the idea of repatriation or restitution as discussed by Förster. Despite the seeming loss of valued heritage and the violation of core museological values, both acts may also be constitutive of new or changing relationships—between the Walker Art Center and local Native American communities, in Lidchi’s example. Lidchi situated her discussion in the history of epistemic violence entailed by previous museological “otherings.” She questioned the effectiveness of current representational strategies—authentification, immersion, or contextualization—in conjuring up and remitting this inheritance. Such shortcomings become hyper-visible today, she suggested, as representational forms become dated at ever shorter intervals and rapidly lose their ability of responding to emergent notions of identity or alterity. Ideas and acts of refusal, then, also seem to address some of the impasses inherent in the critique of Native American and Indigenous artists, who have been extraordinary successful in penetrating institutional spaces from which their work and perspectives had previously been excluded. If such postmodern or postcolonial interventions always run the risk of inadvertently legitimizing the very structures they critique, does refusal open up new spaces for debate that point beyond appropriation and toward negotiations of incommensurability? The politics inherent in the institutional infrastructures and conventions of representation also formed a core problem in Katharina Schramm’s account. As part of a research project on political subjectivity, Schramm collaborated with Greer Valley and activists of the Fees Must Fall movement at Stellenbosch University. What had started as the idea of a living archive of the student protests—directed against forms of exclusion inherited from apartheid South Africa—was soon confronted with some of its own structural and representational limitations. After distancing herself from the student protests, the curator of the exhibition stepped down, arguing that a living archive was impossible to realize if archivists themselves were not fully involved in the movement they sought to document. Greer also questioned whether the project’s de-colonial objectives and critical engagement with institutional hierarchies were fully realizable in an academic context. With respect to representational conventions, she worried about the modes of visual consumption prescribed by the format of the exhibition and how they might conflict with the modes of critical engagement pursued by the participating artists and activists. Schramm recounted how their conversations about the initial failure of the project resulted in new forms and formats of debate—a panel on the relationship of art and activism, a series of film screenings and performances and, resulting from these, the exhibition “Phefumla! (breathe)” at District Six Museum and Goethe Institute Johannesburg. Discussant Alya Sebti, director of the gallery of Berlin’s Institute for Foreign Cultural Relations (ifa), tied discussions of refusal and incommensurability back to the limits of representation. Sebti introduced the ifa exhibition “Carrefour / Treffpunkt,” the video work Crossings by Leila Alaoui in particular, as an attempt to develop a different language of showing and facilitating engagement. Instead of representing migrants or migration, the exhibition sought to manipulate established looking-relations and the distance they create by evoking a sense of encounter and empathy. This term inspired lively discussion among symposium participants, who questioned whether empathy could ever be fully divorced from paternalism and the power imbalances that give rise to paternalistic practices and attitudes. It was refreshing to hear Sebti address some of the working conditions defining cultural production in the field of contemporary art. Her talk raised some interesting questions as to how seemingly contradictory pressures, such as the need for big names from the field of theory and the very short half-life of artistic, thematic or theoretical currents, impact curatorial ethics or the sustainability of artistic interventions. Throughout its development as an academic discipline, anthropology has continually redefined its relationship to the museum: from the early intimacies of “museum-age anthropology” (Sturtevant), to alienation, abandonment or outright hostility, to a critical engagement with the history of ethnographic collecting or the museum as a “contact zone” (Clifford), in which (post)colonial relationships are recovered, performed, negotiated. How then to define contemporary and emergent relationships between anthropology and the museum, especially with a view to their complex historical entanglements? This question was taken up in the panel on the post-ethnological, a concept circulating among museum theorists and practitioners today. As chair Margareta von Oswald pointed out, she didn’t select the concept in the hopes of providing definitive answers. Rather, panelists were invited to interrogate its potential to think about the changing practices, discourses, materialities, and social formations that are taking shape in and around contemporary museums. For von Oswald, the different usages of the terms “post-ethnological” or “post-ethnographic” reflect above all the ongoing contradictions, unease and discomfort that shape the field of ethnological museums today – ranging from James Clifford’s definition of it as a “following from with a difference” to a more radical opposition to former ways of working with ethnological collections, such as suggested by Clémentine Deliss’ practice in the Weltkulturenmuseum in Frankfurt. von Oswald suggested that rethinking the museum implied a reconfiguration of the role of research within its walls, and most urgently, the role of anthropology. Clémentine Deliss’ work as director of the Weltkulturenmuseum in Frankfurt has offered a series of impulses for such reconfiguration. Between 2010 and 2015, Deliss curated exhibitions that were based on a residency program. The residents – contemporary artists, lawyers, poets – were invited to engage with objects from the museum’s collection and to develop new work based on their research. Deliss spoke about some of the difficulties and obstacles she encountered in her work, especially the goal of opening up collections-based research to actors from a diversity of disciplinary backgrounds. Access to collections, she suggested, continued to be policed by custodians whose reluctance to engage with theoretical, curatorial or aesthetic impulses beyond the field of classic museum anthropology are indicative of persisting divisions between museum and academic anthropology. Partly a result of this, Deliss recounted how non of the new work produced during her tenure was inventorized in the museum catalogue, whose classificatory structure represented another obstacle to the integration of commissioned objects. Moreover, Deliss argued that “Indigeneigty” has emerged as a new form of ethnicity defined by an identity politics that precludes other forms of engagement with the collections. For unprovenanced objects especially, which she described as “epistemic and aesthetic amputees,” any contribution should be understood as gift. Finally, Deliss criticized the construction of large-scale repositories away from the exhibition spaces of the museum. Contrasting these developments to the “university museum”, whose architectural make-up encouraged access and inquiry, she stated that such infrastructural decisions can effect not only how museums work but also their public perception. In order to access the potentialities of the post-ethnological, she concluded, its unfulfilled promises must be subjected to critical investigation. In her introduction, von Oswald had proposed to think of museums as sites for the production of knowledge and meaning-making, asking what anthropological work inside the museum can look like today. Speaker Dan Hicks, who is an Associate Professor at Oxford University’s School of Archaeology and Curator of Archaeology at the Pitt Rivers Museum, took up this question. Hicks offered a tour de force through the history of theoretical shifts and paradigms in anthropology, always tying these back to their particular articulations with collections-based research. Theoretical work within anthropology, he reminded us, has always constituted a response to change—reacting to and making sense of broader political, economic, or cultural transformations. Our understandings of the museum, he noted, have equally responded to changing configurations of the public, while at the same time developing in conversation with anthropological theory. The museum as “full of objects,” Hicks argued, is an idea closely tied to evolutionary anthropology. The museum as “full of people,” by contrast, articulated culturalist ideas, which themselves had responded to the rise of multicultural understandings of society. Hicks traced connections between relationalism, actor-network theory and James Clifford’s famous introduction of the “contact zone” into museum theory. In the context of debates about multinaturalism, ontology or perspectivism, then, museums are increasingly conceptualized as full of concepts and knowledges. This includes, he explained, the knowledge encoded by message sticks as well as the ideas developed by their collectors. Knowledge, in these scenarios, is understood as always unstable, always incomplete—a product of what Lévi-Strauss has called The Savage Mind. Hicks’ presentation enabled an understanding of museum artifacts as always provisional, as “unfolding events,” which recently have come to include the transformation of knowledge that is a product of empire. He argued that anthropological work inside the museum is especially productive in approaching the production of knowledge as informed by the collection of objects, and vice versa. Such an archaeological understanding, he suggested, is not only attuned to the ways in which anthropology constitutes a response to social change, but also to how knowledge production itself always involves (material) intervention. In making it possible to “think the nonhuman,” for instance, collections-based research holds the potential to revisit the conceptual legacies of anthropology as well as their conditions of production. In this context, the museum may constitute a privileged site from which to re-examine Western systems of thought, by asking how their development has been informed by other forms of knowledge. To address this question, chair Christine Gerbich pointed out, it is important to interrogate the idea of “the public” itself. This means taking into account not only museum visitors, she said, but also those who stay away, as well as other groups and representatives who directly or indirectly influence the work of museum professionals. While public engagement is a term that is hardly missing from the mission statement of any museum, Gerbich noted that its actual meanings are probably some of the least understood. And while there are few museums that would not subscribe to the goal of creating “spaces for self-directed learning,” there is little consensus as to what such a space looks like in practice or how it should be realized. What is the relationship between the interpretative repertoires created by academics and the ways in which museum-goers actually make sense of their own experience? And does emphasizing this difference necessarily imply subscribing to the idea that all interpretations are ultimately “subjective” and thus equally valid—a position often associated with the idea of “dumbing down” museum education. Gerbich mentioned the co-development of educational material between community members and museum professionals as a more integrated approach, which which tackles some of these issues by locating engagement at an earlier point in the process of exhibition-making. Speakers Laura Peers, curator of the Americas Collections at the Pitt Rivers Museum and Professor of Museum Anthropology in Oxford, and Bonita Bennet, director of the District Six Museum in Cape Town, made clear the contextual dimensions of engagement—how they relate to individuals or groups of people involved, and to the historical times and local contexts museums are embedded in, for instance. Peers spoke of her ongoing collaborations with members of the Haida Nation from the Pacific Northwest Coast. Inspired by a renewal of material and cultural practices starting in the 1960s, the Haida have successfully repatriated all known ancestral remains, and are currently directing a lot of energy toward reconnecting with and starting conversations around sacred and funerary objects in museum collections. Peers addressed some of the central questions coming out of her collaboration with the Haida: How does one critically account for the various forms of value that arise from community engagement practices, including the generation of social and ethical capital for the institution? Such transactions, she argued, complicate established narratives of generosity, access, and sharing. In addition, the objective of building long-term, sustainable relationships throws up issues such as mobility as well as the temporalities, politics, and availability of funding. One issue that arose throughout her work with Indigenous delegations was what Peers described as “battles over handling.” Her interlocutors’ desire to hold masks up their faces or to dance certain objects in the Pitt Rivers Collection frequently entered into conflict with the concerns of museum staff over conservation. Engagement with the Haida therefore required finding solutions that satisfied both sets of concerns. For curators and conservators at the Pitt Rivers, this meant adopting different ways of reading and valuing the materiality of museum objects. Physical alteration, for instance, came to be understood not as damage, but as marks of an object’s continuing social life. In closing, Peers agreed with Förster’s reflections about the potentials of repatriation. Rather than closure, repatriation in the context of her work with Haida representatives took the form of deep and ongoing engagement. The future of engagement, she concluded, would require putting an end to token consultations without decision-making capacities and replacing them with forms of curation based on active sharing, reciprocity, and dialog. “How can museum work contribute to human rights?” Bonita Bennett introduced this as a central question motivating the founding of Cape Town’s District Six Museum. Established in 1994, the museum started as a space of memory for those black South Africans who had been forcibly displaced from the Sixth Municipal District of the city, which had been a vibrant community of freed slaves, immigrants, merchants, artisans, and workers until the beginning of the 20th century. Through what Bennett called a “model of engagement with engaged members of the public,” the museum began to collect items that people had held onto after their forced removal from the district, which was declared a “white area” in 1966. Work with artists and artisans, storytelling projects focused on food and food production, or collaborations with local seamstresses in designing a project series—Bennett introduced a number of examples to illustrate the museum’s investment in the building of long-term relationships. Visiting scholars, she explained, were asked to actively integrate these connections into their research at District Six, and many of the museum’s programs are designed to cope with local issues such as poverty. Throughout her talk it became clear that District Six as an institution would be unthinkable without its relationships to members of the local community. Central to this, one could argue, is the realization that no collecting institution would exist without the social relationships embedded in its collection, however varied or contested their form. Commentator Ute Marxreiter, an educational curator for the Ethnological Museum Berlin and the city’s Asian Art Museum, offered insights into her work for the Humboldt Forum, the large scale museum project that will house the new exhibitions of both institutions (among others) from 2019 onwards. Marxreiter elaborated the complex institutional setup of the Humboldt Forum, explaining the relationships between its founding directors, the Stiftung Humboldt Forum im Berliner Schloss, the Humboldt Forum Kultur GmbH, and the Prussian Cultural Heritage Foundation, itself responsible for the management of a variety of different cultural institutions. This framework, she noted, resulted in a challenging environment for museum educators, charged with the task of conceptualizing general strategies of engagement while at the same time coordinating the activities of different stakeholders. 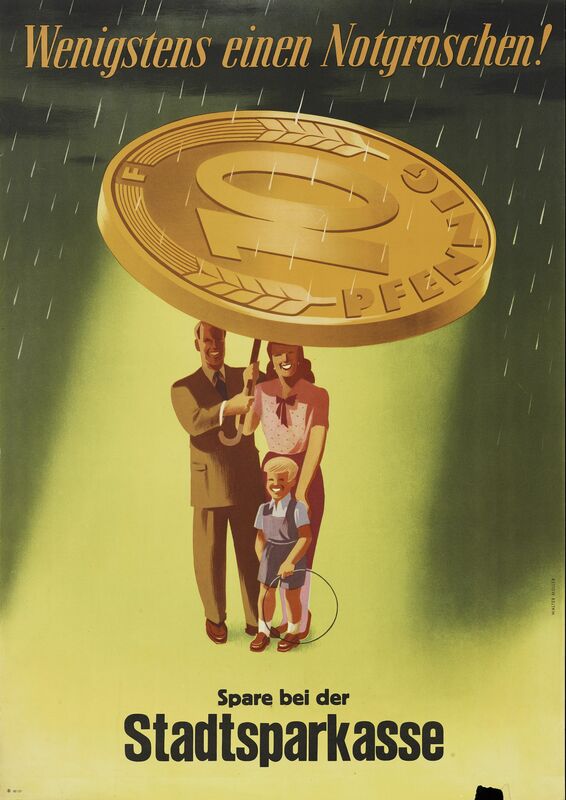 Marxreiter introduced the project “Watch out, Children,” the second exhibition realized under the aegis of the Humboldt Forum steering committee. Consisting of 160 objects from various collections in Berlin, the show sought to highlight ideas and practices of child protection from a broad array of cultural and historical contexts. Marxreiter presented a research project she was involved in at the Ethnological Museum, which focused on the history of missionary schooling at the Beagle Bay Mission in Australia, and thus introduced critical questions about the role of colonial power relations to the exhibition and its concern with “protection.” This project, she explained, illustrates the need for critically reflexive approaches to engagement and education in postcolonial contexts. She critically pointed out that, however, that despite its constructivist orientation, the institution’s educational approach did not necessarily allow for the incorporation of reflexive formats. In her concluding remarks, Erika Lehrer (Concordia University) suggested that collaboration could be understood as the “infrastructure” behind all other conceptual discussion. This was a reference to Sowparnika Balaswaminathan’s contribution to the World Café tables which had concluded day two of the symposium. An exercise in theory-speed-dating of sorts, this format introduced a proliferation of concepts that have not yet found full entry into museum scholarship, while also dynamically intervening into the hierarchies among established and early career scholars that often characterize academic events. CARMAH researcher Duane Jethro concluded his reflections by emphasizing the need not only for new concepts, but also for strategies of unlearning and undoing—an epistemological practice, he argued, that should be central the objective of de-colonization. Another discussion that emerged in both Lehrer’s and Friedrich von Bose’s (Humboldt-Universitität zu Berlin) reflections concerned the “location of criticality” (Lehrer) in current museum research. Is criticality a domain of museums themselves, or should critical museology adopt an “arms-length approach” (von Bose) to museum and collections-based research? Throughout, therefore, the concluding remarks did not so much offer closure, but reflected the need and a desire to continue the critical conversations that were facilitated and inspired by the Otherwise Symposium.